These are some of the ways in which plants reproduce asexually, and it’s kind of freaky if you think about it. 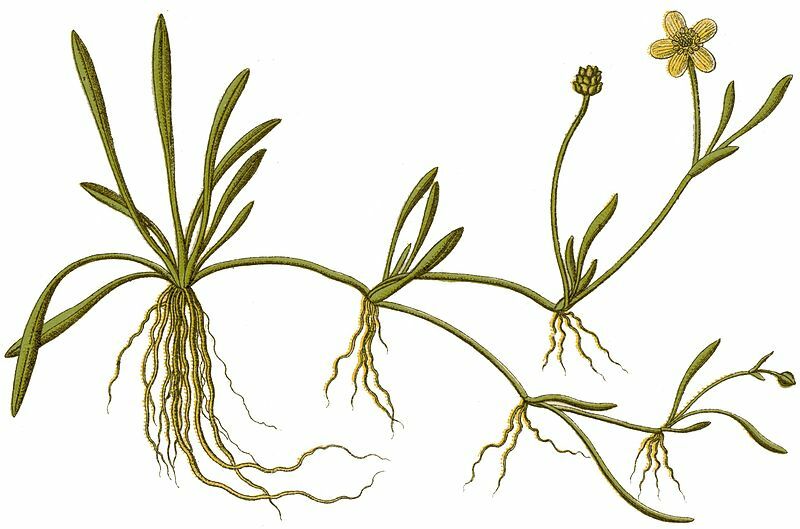 Plants can clone themselves. But one major disadvantage of reproducing this way is that clonal offspring are genetically identical to the parent plant, which truncates any advantage that might be gained by genetic mixing between two separate plants. For one, it means that a plant population composed of all clones is at risk of being wiped out if something in the environment comes along (such as a disease or change in climate) and none of the plants in the population have adapted any sort of resistance to it. That’s where seeds come in. Seeds are produced sexually, when the gametes of one plant fuse with the gametes of another. Genetic recombination occurs, and a genetically unique individual is born, housed within a seed. Unless, of course, that seed is produced asexually. Then the seed is a clone, and we’re back to where we started. Apomixis is the process by which seeds are produced asexually. In flowering plants, this means that viable seeds are formed even when flowers haven’t been pollinated. In some cases, pollination stimulates apomixis or is required to produce endosperm; but either way, the result is the same: an embryo containing an exact copy of the genes of its single parent plant. To understand this process, it’s important to familiarize yourself with the basic anatomy of an ovule, the part of a plant where embryos are formed and which ultimately becomes a seed. 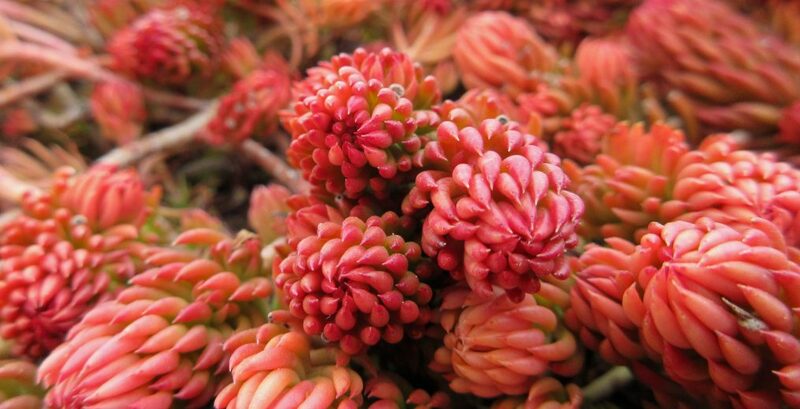 In gymnosperms, ovules sit inside cones; in angiosperms, they are surrounded by an ovary. The wall of the ovule is called an integument. A small opening at the top of the ovule, known as a micropyle, is where the pollen tube enters. 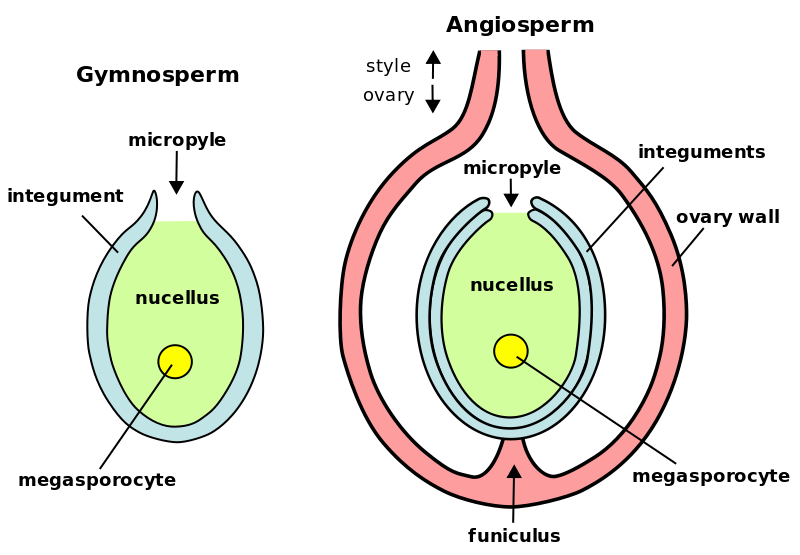 Diploid cells of the nucellus compose the interior of the ovule, and within the nucellus resides the megasporocyte, which is where meiosis occurs and egg cells are produced. In sexual reproduction, a germ cell introduced through the pollen tube fuses with the egg cell to form a zygote and eventually an embryo. In the case of apomixis, the fusion of germ cells isn’t necessary for an embryo to form. There are three main types of apomixis: diplospory, apospory, and adventitious embryony. In diplospory, the megasporocyte skips meiosis and produces diploid cells instead of haploid cells (germ cells). These unreduced cells go on to form an embryo inside of the embryo sac, just like an egg cell would if it had been fertilized with a pollen cell. Additional unreduced cells go on to form endosperm, and the ovule then matures into a seed. This type of apomixis is common in dandelions (Taraxacum officinale). As much as bees love visiting dandelion flowers, their pollination services are not required for the production of viable seeds. Yet another reason you are stuck with dandelions in your yard whether you like it or not. In apospory, an embryo develops inside of an embryo sac that has been formed from cells in the nucellus. Embryo development within the megasporocyte is bypassed; however, pollination is usually necessary for endosperm to form. Plant species in the grass family commonly produce seeds using this type of apomixis. Adventitous embryony is also known as sporophytic apomixis because an embryo is formed outside of an embryo sac. Cells from either the integument or the nucellus produce an embryo vegetatively. In this case, a sexually produced embryo can form along with several vegetatively produced embryos. Extra embryos die off and a single, surviving embryo is left inside the mature seed. But not always. Two or more embryos occasionally survive, including the sexually produced one. The mature seed then consists of multiple embryos. This phenomenon is called polyembryony and is common in citrus and mangoes. When it comes to plant breeding, polyembryony is incredibly useful because the asexually derived seedlings are exact copies of their parent, which means the desirable traits of a specific cultivar are retained. 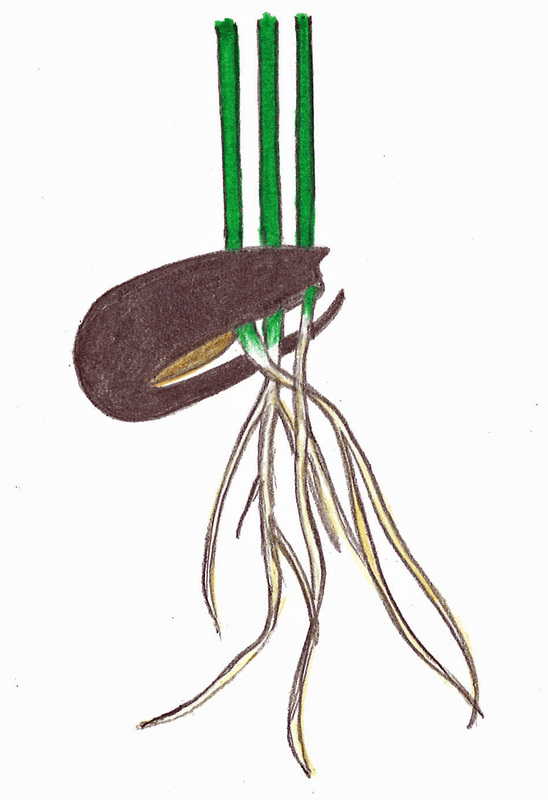 Depiction of seed with three viable embryos after germination. Polyembryony can occur in a number of ways, and not always as a result of apomixis. In some species, additional embryos “bud off” from the sexually produced embryo. This is called cleavage polyembryony and is known to happen frequently in the pine family (Pinaceae), as well as other plant families. Another common form of polyembryony in gymnosperms is simple polyembryony, in which several egg cells in a single ovule are fertilized resulting in the development of multiple embryos. This doesn’t always mean there will be multiple seedlings sprouting from a single seed. Most embryos usually fail to mature, and only one prevails. However, sometimes more than one survives, and if you’re lucky, you’ll find a seed with multiple plant babies pushing out from the seed coat. This entry was posted in Botany and tagged angiosperms, apomixis, asexual reproduction, Botany, botany lessons, dandelion, embryo, embryo sac, gymnosperms, megasporocyte, meiosis, nucellus, ovules, Pinaceae, polyembryony, Ranunculus, reproduction, seed oddities, seeds, sexual reproduction. Bookmark the permalink. What a great post. Thanks! A whole new side of gardening that I’ve never researched “Chopping off your finger and growing a whole new you” is a great way to explain cuttings! Ha! Thank you! Glad to hear you liked the post. I have always loved telling people that dandelion is from the French dent-de-lion, lion’s tooth, for the shape of the leaves. But your description of asexual seed production in dandelions is even more fascinating- thank you for this entire blog. I love sharing fun facts about dandelions too! Thank you for reading!